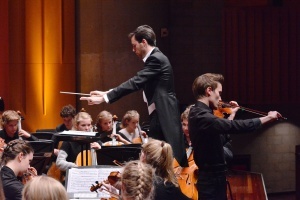 IT WAS an extraordinary moment when conductor Leonard Weiss took the podium last night at Llewellyn Hall to lead the combined forces of the Mannheim Youth Symphony Orchestra from Germany and the Canberra Youth Orchestra in a fiery performance of Tchaikovsky’s last great Symphony the Symphony No. 6 in B minor, Op. 74. Known as the “Pathétique” because of its Tchaikovsky’s state of mind at the time he wrote it, and the sombre conclusion, this symphony proved the perfect choice for the combined forces of more than 120 young musicians. There is a lot of potential for individuation among the instrumentalists in this work, making it a perfect showpiece, but they worked best together as when as in the opening movement, they performing the more dramatic elements of the symphony. Having said that, the fine players in the wind section effectively asserted themselves over the huge string component in the quieter sections. This was a young orchestra, and it was a pleasure to see musicians swaying to the music with evident pleasure and immense physicality in the second movement. It is curious how dark some listeners consider the “Pathétique” to be when you know that the composer considered it a celebration of the best in us. Weiss seemed to sense that, leading the musicians at breakneck speed at times and militaristic precision in the martial sections. But in the final movement he guided them sensitively to a more tragic conclusion that saw the musicians conclude in near silence. The “Pathétique” may have been the central work on the program but it was by no means the only one, and was preceded in the first part of the evening under the baton of German conductor Jan-Paul Reinke, by three very fine performances by the visiting musicians. Mendelssohn’s overture, The Hebrides Opus 26, saw the musician produce a full-bodied sound full of urgent anticipation – a good opener. 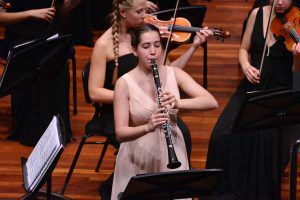 There followed Weber’s concerto for clarinet an orchestra in F minor Opus 73 performed by Mannheim clarinet soloist Rebekka Rebmann. After nervous moments at the start, this three- movement work was performed with fluid clarity and elegance, really picking up in the allegro section. There followed a fine performance by young violinist Lukas Ringle, of “Nigun” (a reference to vocalising in Jewish chant) from Bloch’s “Baal Shem”. This was marked by extremes of passionate intensity and control. Conductor Reinke, who appears to have gift of getting musicians almost jumping with joy, returned to the podium right at the end. You would have thought the Tchaikovsky was a hard act to follow but no, the entire combined orchestra gave us the opening bars of Strauss “Thus Spake Zarathustra”, ending an evening of exciting music and an international collaboration to remember.